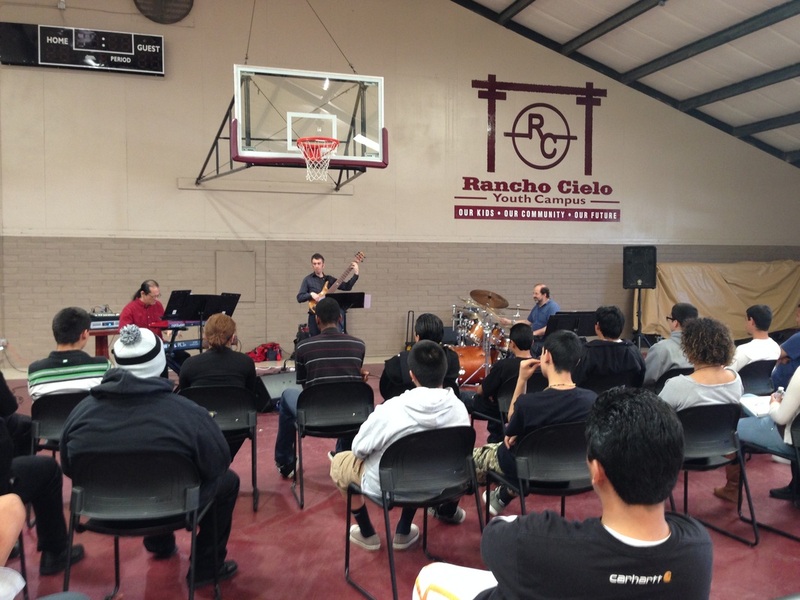 This discussion introduces participants to the many styles of traditional and contemporary jazz. The group demonstrates matched pairs or triplets of traditional and contemporary tunes for each style. For example, they play a traditional swing tune and a contemporary one (Autumn Leaves vs. Got a Match? ), a traditional bossa nova, a contemporary samba, and a modern salsa (The Girl from Ipanema vs. Latina Una vs. Criss Cross), a traditional ballad and a contemporary one (Body and Soul vs. Wish I Were There), a funk tune (Chromazone), and a mixture of these styles (Soko Ban). Each demonstration highlights the evolution of the style over decades. To demonstrate how the trio works together in established a style, they focus on a particular contemporary funk tune, entitled "Mobius Trip". First, the drummer demonstrates his part alone and explains the components of his basic beat. Then, the bass player demonstrates his part alone, and the drummer joins in. Finally, the keyboardist demonstrates his part alone and explains how it fits in with the bass and drums. In short, this section illustrates for participants with many feelings and emotions that contemporary electric jazz expresses by contrasting them with the more traditional approaches. Many traditional jazz compositions are relatively short (only 12 to 24 bars long), and performances of them involve a standard structure (melody - solos - melody). Most of Charged Particles' material is much more compositionally complex and highly orchestrated. The band explains the compositional process by focussing on a tune written by bassist Aaron Germain. Aaron explains how he conceived of the tune, what his models were, and how each part of the composition fits with the others. This section focuses on how Charged Particles was formed, how its stylistic directions were chosen, and how it evolved from a fledgling ensemble into an established professional organization. This discussion addresses the notion of teamwork and the challenges in evolving a collective vision for an artistic partnership. The program ends with a performance by Charged Particles of one of its more complex and challenging compositions, Shrubbery. The participants are briefed in advance about the structure of the composition, and they are given a hand-out to follow along as it progresses during the performance. All the elements of the previous discussions are nicely illustrated in this closing piece.